First automation in press shop involves auto feeding of coils in to presses to make blanks and for progressive stamping. An auto coil feeding system consists of up to three basic components: uncoiler, straightener, and feeder. These components can have varying degrees of complexities and can have several accessories. A conventional coil feeding system has these components arranged in tandem, whereas the new trend is to combine these components to make more compact systems, like straightener feeders. Oriimec of Japan (www.oriimec.co.jp) is the world famous supplier of coil feeding systems and other press automation equipment. Their main factories are in Japan but they also have a major factory in China. Most of our common requirements can be met from their China factory at very competitive prices. Please find below a brief description of popular Oriimec products. 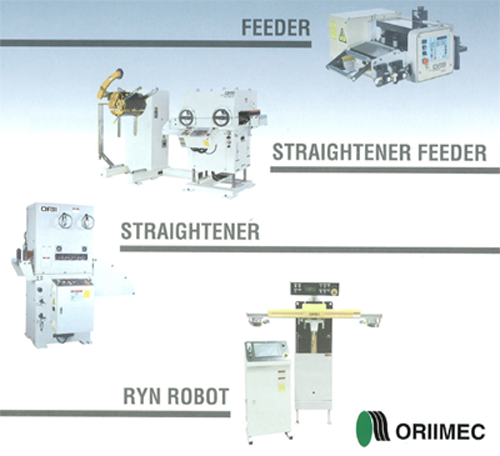 The Oriimec product line includes NC roll feeders, Compact straightners, Precision straightners, Uncoilers and Compact Uncoiler/straightner/feeder. Only Oriimec’s high technology could design and build a fully automatic Straightner/Feed Combination of Superior quality. Oriimec’s Computer Control Servo Systems introduce the combination of high Quality and functional machine that are totally operator friendly. Responding to the demand for maximum space-saving on the shop room floor, Oriimecs uncoiler/ straightener/ feeders have a compact footprint without sacrificing quality or speed. ABV have been promoting Oriimec products in India for many years. Please find below a partial reference list. ABV provide the installation and maintenance services for Oriimec machines.